It’s 2019, and what does the year of the Earth Dog has in store for us? High-tech pet essentials! We know for a fact that technology is rapidly progressing as time flies. In this day and age, we enjoy the convenience of gizmos and gadgets aplenty! Embracing technology has made our lives easier and more productive in this fast-paced world. But who says dogs can’t be techie just like us? You can start by getting the best dog GPS trackers for your canine companion! If you can keep a digital scrapbook of your online purchases, activities, and whatnot, why not do the same for Doggo? Your dog is your best friend, fur-baby, and anything in between. That is why a GPS tracker is godsend for all of us dog parents, especially if you have a dog that sometimes goes footloose and fancy free. Gone are the days where you have to ask your sulky neighbors if they have seen your dog. You don’t have to bother making search and rescue parties, either. With the best dog GPS trackers, you can reveal Doggo’s location in the palm of your hand. A GPS tracker saves you from the emotional and physical stress from continuously checking on possible places such as shelters. It isn’t easy to carry a pang of negative emotions while searching for a missing dog. You don’t want your dog to end up at the pound. A majority of runaway dogs who do are euthanized when not claimed after a particular period. To prevent this from happening, make sure your beloved rascal has his own GPS tracker so even he gets there, he won’t lose his life in the process. A microchip implant is painful for your pet. In some cases, wounds get infected and cause more complications. Likewise, a microchip implant may get dislocated and cause soft tissue tumors. 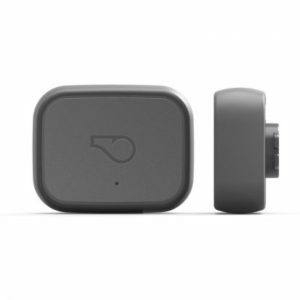 The Whistle 3 is perhaps the simplest looking GPS trackers in the market: a small rectangular grey box that has a tiny pinhole on the front and an image of a whistle. However, this small piece of smart tech delivers unsurpassable reliability in keeping tabs on your dog 24/7. Apart from the GPS data that is transferred to your smartphone, the Whistle 3 also tracks your dog’s activity levels similar to Fitbit. The Whistle 3 measures 1.82” x 1.45”, which is the perfect size for a 1-inch collar. Anything larger may annoy your dog and may tempt him to chew it to bits. What makes the Whistle 3 an outstanding unit is also the fact that it is user-friendly. All you need to do is download the free Whistle app, which is compatible with iOS 9.0 and Android Lollipop or later. Then simply create an account, enter some information, mark ‘home’, set the safe zone, and enter your dog’s name. Once everything is set up, you can access all your dog’s data as simple as opening the app. You’ll see two separate screens in the app: one for showing your dog’s location via Google Maps and the other that shows your dog’s status. The device battery can last for 10 days and warns you when it gets low. By releasing a tiny clip on the tracker’s side, you’ll find a five-pin connector that you can plug into your computer to collect data. Likewise, this product comes with a compact docking station that will enable you to convert the non-standard connector into a USB port so you can sync with any computer. The highly compressed data is sent over using a 2G network, which means you will never lose connectivity even in rural areas although the amount of data transmitted is reduced. Regardless, you can choose to connect to Wi-Fi so you will get real-time notifications so you can get alerted each time your dog starts to leave the safe zone. It isn’t a secret that dog parents only want the best for their fur-babies; hence, it is no surprise that a luxurious smart dog collar such as the LINK AKC exists. 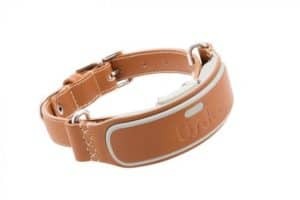 The LINK AKC smart collar, which is crafted by dog-loving experts, is a combination of high technology and fashion. The collar is made of premium latigo leather, which is designed in a convex-shape to comfortably conform to your dog’s neck. With the LINK AKC smart collar, you can easily set custom notification alerts and track your dog’s location with just a press of a button. It will automatically send you a notification as soon as Doggo wanders away from the designated safe zone. Likewise, the LINK AKC smart collar provides daily activity monitoring and recommendations so you will be guided in managing your dog’s health based on its age, breed, and size. It also has a temperature check so you will be alerted when your Dog is feeling too hot or cold. All these notifications happen through its iOS and Android app; however, you need to pay monthly subscriptions to keep the collar connected to a cellular network. Moreover, the LINK AKC features a unique remote-activated LED light so you can find your dog’s whereabouts even when he’s hiding in the dark. This smart collar will surely get the job done whether you are trying to keep Doggo safe or just looking for a way to know how he’s keeping up beyond the comforts of home. But what makes LINK AKC smart collar stand out is the fact that you can document Doggo’s escapades, save memorable moments, and share it with friends on social media. The Garmin Alpha 100 GPS Bundle is the perfect deal for a sporty dog owner who loves exploring the great outdoors with his pack. 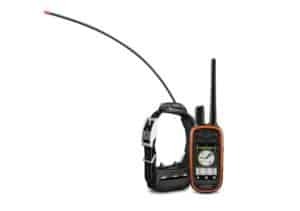 This bundle includes the handheld Alpha 100, the TT10 GPS e-collar, a rechargeable Lithium-ion pack, an AC adapter, an extended range antenna, a belt clip, a split adapter, USB, and vehicle power cables nicely packed in a Tri-Tronics training bag. The Alpha 100 features a glove-friendly touchscreen interface with 18 stimulation options; you won’t have to expose your fingers while tracking your Huskies in the winter. Nonetheless, you may choose to lock-out such feature and switch to traditional and linear stimulation when necessary. Moreover, the Alpha 100 has an incredible battery life, but you can extend it further under the ‘Rescue Mode’. With its split adapter cable, you can charge the TT10 GPS e-collar and the Alpha device simultaneously. With a swipe of a finger, you can have access to 100 pre-loaded maps from around the 50 States of America, which also include elevations, roads, streams, etc. In addition, there’s a waypoint marking feature that indicates the location of your vehicle. The Garmin Alpha 100 provides groundbreaking GPS tracking: you can track up to 20 of your furry buddies within a 4 – 9-mile radius using the BaseStation feature that you can load to your laptop. There is also a BirdsEye Satellite feature, which is synced to the waterproof e-collars, allowing you to gain a realistic view of the area that your dogs have traveled. Lastly, you can use the BaseCamp feature to create specific waypoints and boundaries. You can even share your adventures online using the free app, Garmin Adventures. The SportDOG Brand TEK Series 2.0 boasts of its patented HopTek technology, which enables you to train and track 21 dogs up to 10 miles away. The TEK Series 2.0 uses GPS + GLONASS, capturing accurate data from both satellite constellations. Apart from its superior range performance, such patented tech provides superior resistance to certain signal disturbances as well. The handheld device includes 1:100,000 topographical maps, plus unlimited lifetime map updates. You can create an active geofence by drawing a shape on the map using your handheld device. Likewise, you can save up to 20 waypoints. The TEK Series 2.0 uses rechargeable lithium-ion batteries. The collar lasts for 24 hours per four-hour charge, while the handheld device lasts for eight hours per twelve-hour charge. You can vary the level or type of static stimulation for each dog. There are a total of 99 levels of continuous, momentary, rising, tone, and vibration options to choose from. The best dog GPS trackers don’t come cheap, but nothing worth having ever does. Your dog is your forever loyal friend and protector. So seeing him bright-eyed and bushy-tailed is worth investing any amount of money. Although you want to confine him within the comforts of your home, he will always find away to satiate his love for adventure. 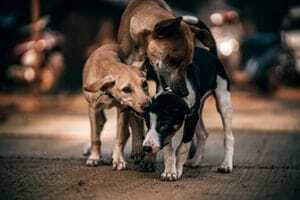 Since you can never be sure as to when he escapes, getting a dog GPS tracker will ensure that you can get your furry buddy back safe and sound. The Whistle 3 would be the best dog GPS tracker for your pal. 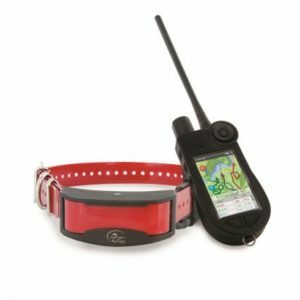 This tracker is very accurate in providing your dog’s location, plus it quickly transmits data to your smartphone.